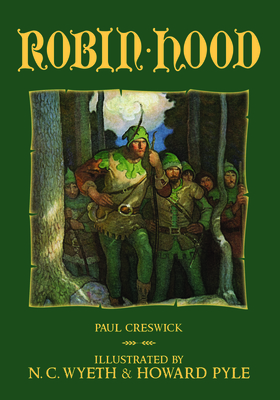 The author of numerous children's books, Paul Creswick (1866-1947) specialized in telling adventurous tales for young readers. His books include Aelfred's Days, Hasting the Pirate, The Smugglers of Barnard's Head, and most notably, the Scribner's Classic edition of Robin Hood. A product of Howard Pyle's Brandywine School, Newell Convers Wyeth (1882-1945) ranked among the leading illustrators of popular fiction in the early 20th century. Best known for his illustrations for such classics as Treasure Island, King Arthur, and Rip van Winkle, he was also a prolific illustrator of magazine and advertising images. Illustrator, author, and teacher Howard Pyle (1853-1911) was the primary figure of the Brandywine School of illustration. His works epitomize the golden age of American illustration, consisting of tales and images remarkable for their engaging simplicity and penetrating realism.